Due to many requests, ITSAN now has a shirt with a very important message! 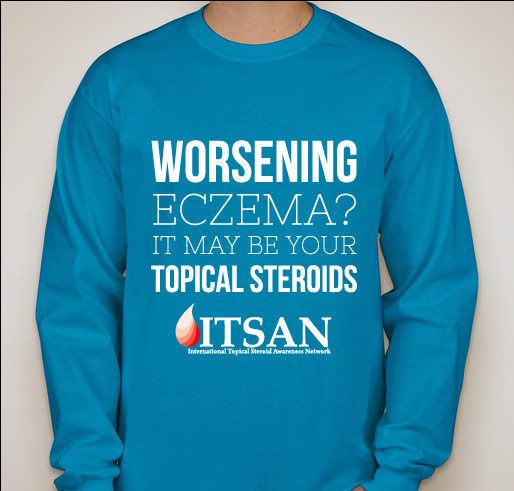 I for one am really glad to have one on order as I run into people everywhere I go that want to know more about my Topical Steroid Withdrawal story and this shirt will open more doors to dialogue about the dangers of this drug. There is a question of how rare Topical Steroid Addiction is and even statements made that addiction to this drug is indeed rare but the truth is, no clinical studies have been done to confirm this assumption. I spoke with my allergist last week and asked him to consider if he took 100 of his 1000's of patients off all forms of topical steroids for 6 or 8 weeks, what would he see? It truly challenged him and his answer was that there are many types of steroids to help patients. He finally admitted that he has a couple of patients that are not responding to any treatments of steroids, Protopic and light booth so they may in fact have this "Red Skin Syndrome" and he promised to read all the literature I brought him and look into it more. That, my friends is how we begin to change this travesty, whether it's rare or not (which I doubt) it needs to stop as the suffering I see in the ITSAN support groups is enough to make anyone with a heart, cry daily forever! If you share the passion of saving someone's skin, please buy a shirt and wear it to share, thanks! Save Someone’s Skin! Share this TSW Documentary! Kline's hell of topical steroid addiction withdrawal. Wow 6 years steroid free this month! My journey with itchy skin. Arrrr! TSW Mates! #3 in blog photo series! Don't ever let doctors tell you. "There is no cure for eczema"
Wishful thinking I be eczema free by Feb 2013! Healing does happen but a later date. Warrior Girl having Fun in the Sun!!! All pictures on this blog are copyright protected and only linking to the site is allowed.. Awesome Inc. theme. Powered by Blogger.